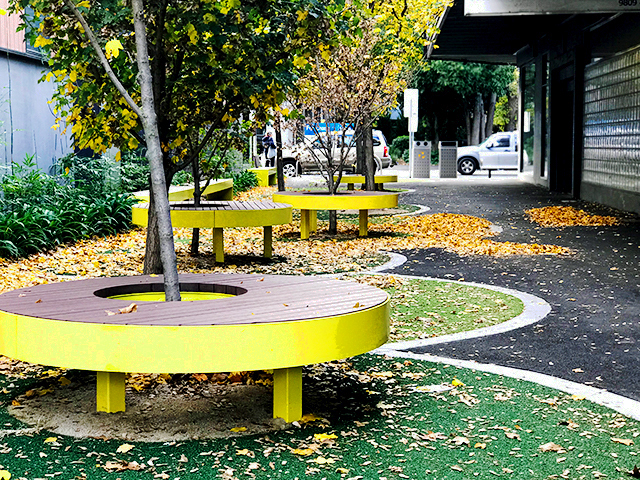 Working in collaboration with Street Furniture Australia, AILA have created #BackyardExperiment, a community initiative that demonstrates the power of public spaces. 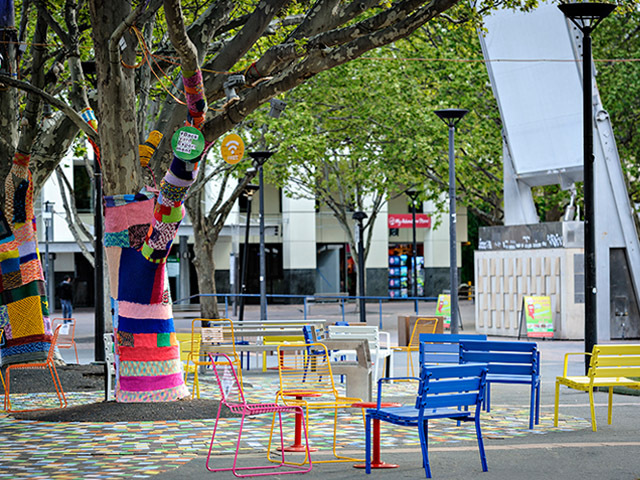 The Australian Institute of Landscape Architects (AILA) in collaboration with Street Furniture Australia, the ACT Government, and In the City Canberra have created the #BackyardExperiment, a community initiative set up in Garema Place, Canberra, that demonstrates how changing public spaces can bring out the best in the city and its people. #BackyardExperiment, designed by landscape architecture firm Context (a Conybeare Morrison company), will feature a pop-up park with moveable furniture, light installation, interactive street art, yarn bombing, free wifi, freshly laid turf, and more to trigger thinking about how the space is used now and reflect on how the installation may change the public environment for the benefit of Canberrans. The experiment will take over Garema Place from 22–30 October, with a time-lapse video capturing the interactions and activity in the temporary installation. 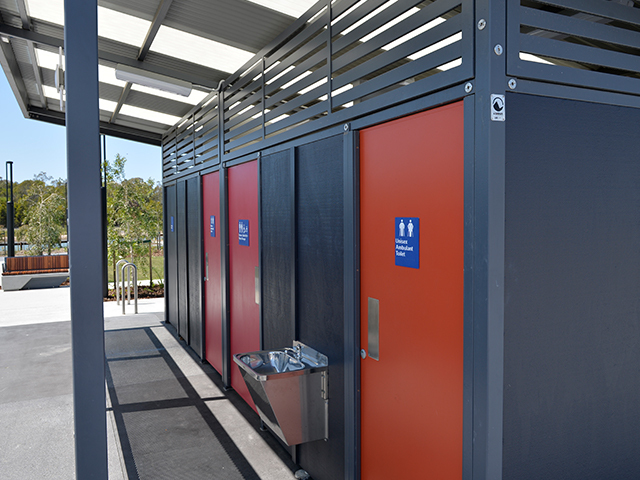 Cameras will be set up to watch and understand how people use a space in three different scenarios: existing; with the addition of Street Furniture Australia's moveable seats and vibrant elements; and with pop-up activations including an outdoor cinema, library and snack cart. 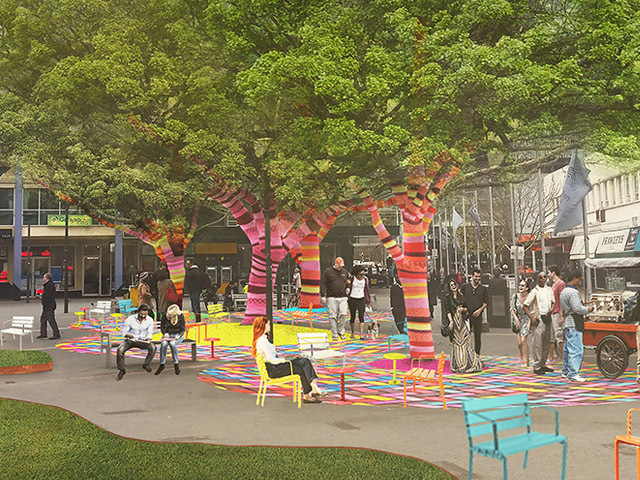 “This experiment aims to encourage the public to engage with Garema Place with a bright and exciting design. Using moveable furniture, it encourages the public to create their own seating arrangements and feel empowered to own the space. 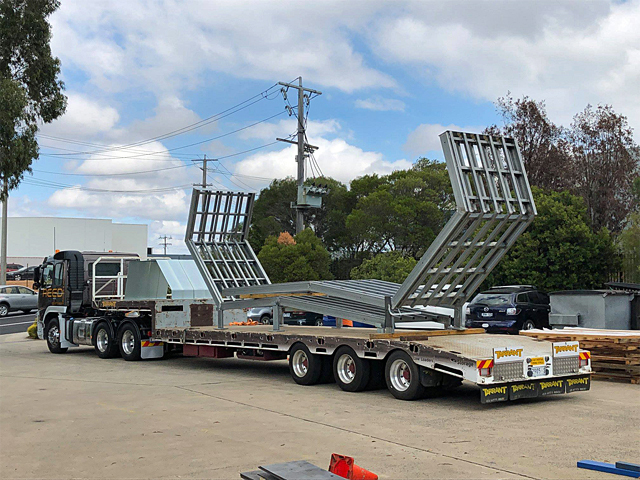 Moveable furniture is a standard feature in European public spaces and it will be interesting to see if the experiment will give confidence to Australian Councils to look at alternate modes for street furniture,” says AILA CEO Shahana McKenzie. One of the main outcomes of this project will be answering questions surrounding how the public react to and interact with moveable furniture. Can we live in a city that provides more flexibility in the way we engage with public space? The observations from this experiment will provide knowledge into how the space is used now and reflect on how the installation may change the public environment. 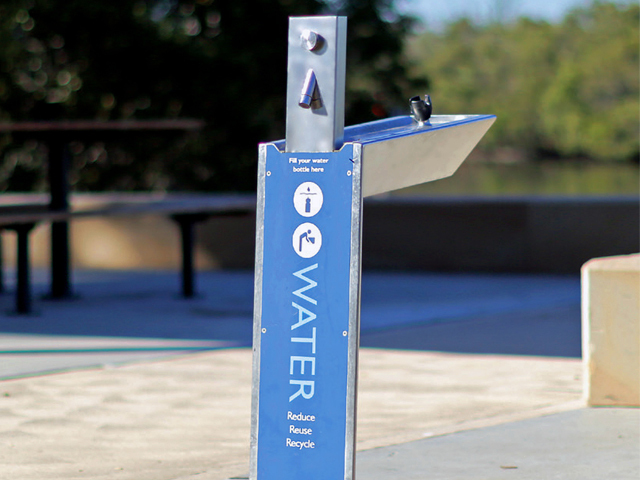 Australian business Street Furniture Australia says it is delighted to partner on this important experiment. The location is fitting given their first piece of street furniture was installed just metres from Garema Place in the 1980s. 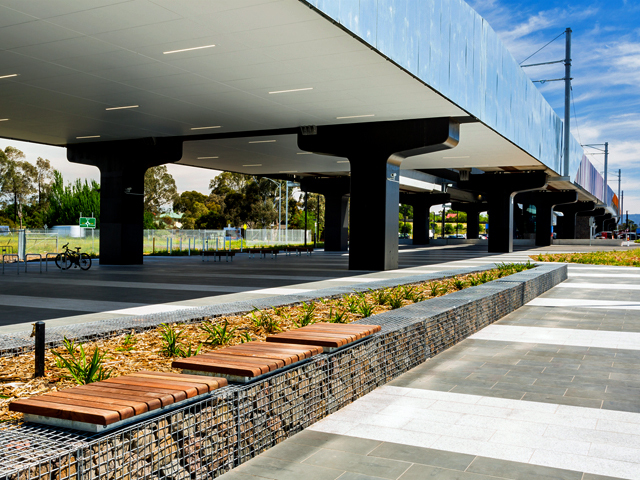 “Now servicing the globe, and having manufactured street furniture for more than 25,000 projects, Street Furniture Australia is committed to industrial design to help create public spaces that engage communities and support urban influencers, in particular, landscape architects,” says Street Furniture Australia Product and Marketing Manager June Lee Boxsell. “The absolute key to designing for people is research. The purpose of #BackyardExperiment is to observe and gain insights about how to improve the user experience of public space. “We also wanted to test the theory that the fastest and most cost-effective way to attract people is to provide more places to sit,” says Boxsell. “Garema Place was a cosmopolitan hotspot in the sixties and seventies but has since become a deserted thoroughfare. Although surrounded by great cafes, shops and workplaces, the open space is largely concrete and underused. Garema Place was selected because of the potential of this space to be a gorgeous plaza owned and loved by Canberrans and visitors alike. My hope is that this temporary activation will generate a flurry of ideas and engagement in the space. One way the public can inform the future of their city is through completing the ACT Governments survey (https://yoursay.act.gov.au/city-action-plan). We encourage all Canberrans to jump on and complete the survey,” says AILA CEO Shahana McKenzie. The #BackyardExperiment is a collaboration between The Australian Institute of Landscape Architects, Street Furniture Australia, ACT Government, In the City Canberra, WE-EF Lighting, Affinity Electrical, Integral Lighting, The Lighting Society, Complete Turf and Landscaping and Back to Front Landscaping. The #BackyardExperiment is part of the wider 2016 International Festival of Landscape Architecture: Not In My Backyard to be hosted in Canberra from 27-30 October. 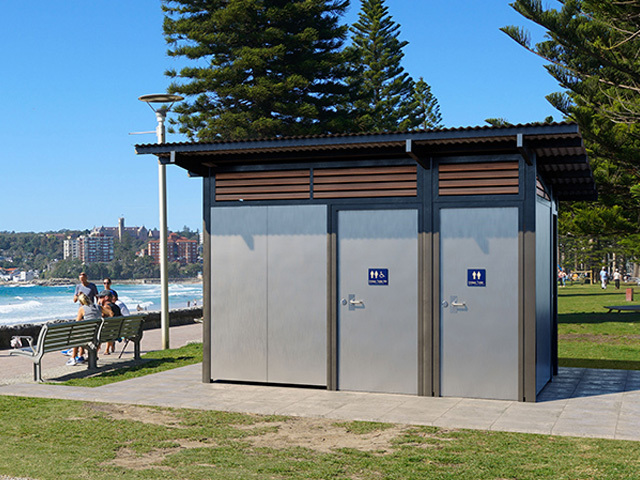 Images courtesy of Street Furniture Australia.